This is one of those ridiculously simple-yet-delicious side dishes that almost doesn’t warrant a recipe. But it’s so tasty I thought I’d write a quick one up and share it! 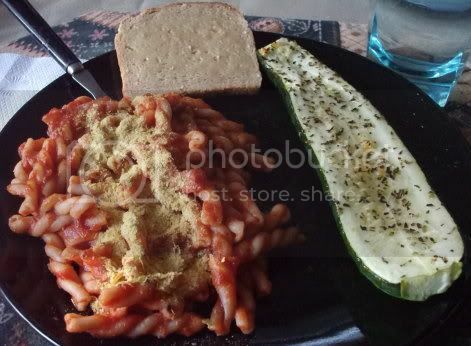 My mom has been making broiled zucchini as a side dish to pasta for ages. Since our garden has been spitting out beautiful zucchini at an almost alarming rate lately, we decided it was time to slice one up and do it again! 1) Set the oven to broil. Place the halved zucchini on a baking sheet, cut side up. 2) Place the olive oil in a cup or small bowl. Crush the garlic cloves into the oil and stir it together a bit. 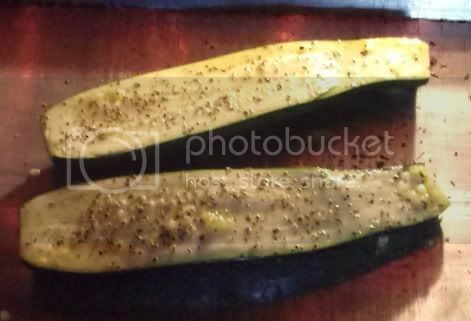 3) Brush the tops of the zucchini with about half the olive oil mixture. Place under the broiler for 5 minutes. 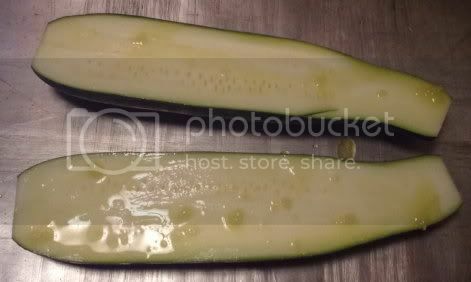 4) When 5 minutes is up, brush the zucchini with the other half of the oil, making sure to cover the whole top and partway down the sides. Sprinkle with Italian seasoning and put back under the broiler for 5 minutes more. 5) Remove from the oven and serve! Yum! I think it’s great to share the “simple’ stuff. I have to remember that many readers are trying out new ways of doing things as they explore eating vegan. Nice post!